In preparation for **coming out of beta September 27, 2014, we’ve launched an all new user dashboard that we’re excited to tell you about today. ** Why the change? We wanted to take the dashboard to a whole new level that will also incorporate the new changes to GenMyModel. ** command (modification) history**. This is especially helpful if you’re collaborating with others (especially as a part of a distributed team) as you can see if the UML model has been modified and the number of commands applied since the last time you opened it. Recent activity for all your projects is displayed on your main dashboard page and Project page, and activity for a specific project is available on the project’s page. more social with options to easily share your models with others or your social networks. Only public models will be viewable by those you didn’t invite as a collaborator. You are also able to edit your user profile. You can even add a description to your model, a great way to highlight what your model is for. Coming soon… We will soon be releasing model versioning which will also be available in the dashboard. What do you think of the new dashboard? 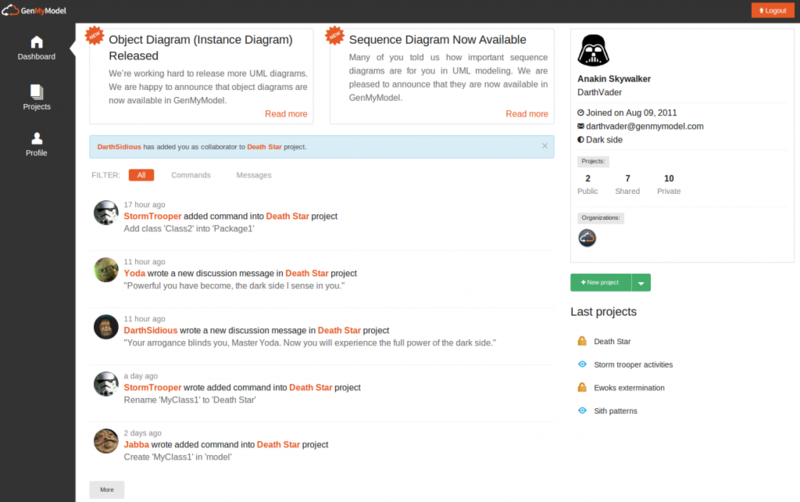 And more importantly, are you on the dark or light side of the force (on your user profile)?